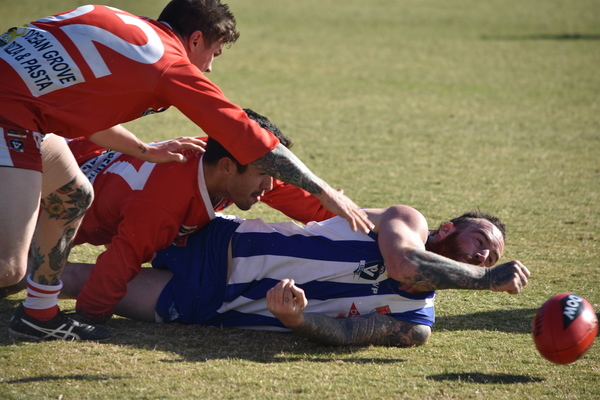 A blistering five-goal opening quarter blitz laid the foundations for Anglesea’s comfortable 39-point victory over Ocean Grove at Alcoa Oval on Saturday 5 May. The flat Grubbers were goalless in the first term as the home side piled on the goals and established a 30-point lead at quarter time. Final scores Anglesea 18.11 (119) to Ocean Grove 12.8 (80). Anglesea (4-2) moved into second position on the BFL ladder, the Grubbers were relegated to third with a 4-2 record. Barwon Heads (6-0) remains the only undefeated side after six rounds. Despite a scoreless opening few minutes, Anglesea gained midfield ascendency and went forward with numerous entries and purpose at the southern end. The Grubbers hit back in the second term to take a lead with avenues to goal through power forward Pete Corredig and dangerous small Luke Cartelli. Both Corredig and Cartelli had a purple patch in the second term and finished with three goals. Anglesea and Ocean Grove combined for 11 goals in a high scoring second quarter. 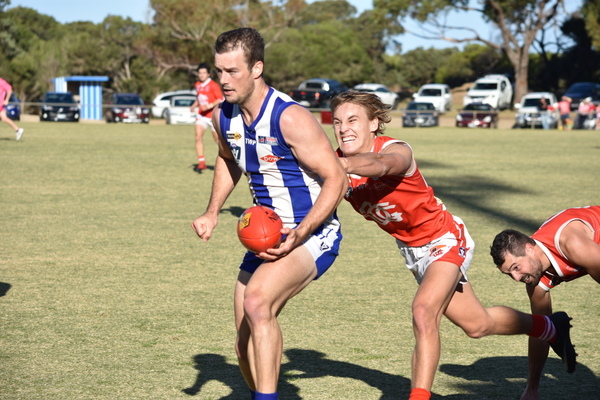 Anglesea coach Paul Carson was pleased with how his side reacted in the second quarter when Ocean Grove hit the front after trailing by five goals at the first break. “Ocean Grove were really a big challenge for us,” Carson told the Voice. “We did our homework on Ocean Grove and where knew exactly of where we needed to be and who was playing who. Ocean Grove coach Paul Lynch declined an interview with the Voice when approached post-match. Kangaroo forward Jordan Erskine was outstanding with five goals, while Ash Caldwell and Ryan Dahlhaus were positive contributors across the midfield. “He (Erskine) was really lively,” Carson said. Anglesea’s James Edmonds booted four majors, while gun forwards Blake Grant and Dale Carson each kicked three goals apiece. After half time, Grubber recruit Karl Staudt had a dominant third quarter and chimed in with three goals. Ocean Grove trailed by 19 points at three quarter-time, the home side controlled the final term to finish with four goals and win by 39 points. Versatile Grubber Nick Lynch did not play after he was sidelined during the week with a knee injury. Lynch appears set to miss 6-8 weeks, while team-mates Shaun Fankhauser (corked thigh) and Patrick Maloney (broken collarbone) were unavailable after they were injured in the club’s Round 5 win over Torquay on 28 April. Corey Walter played his first senior match for the Grubbers in 2018. 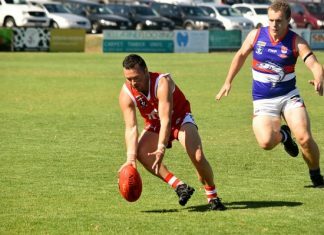 IT was a much brighter note for the Ocean Grove reserves grade – the Grubbers won its third consecutive match after defeating Anglesea by 27 points in the curtain raiser. Final scores Ocean Grove 9.10 (64) to Anglesea 5.7 (37). The Grubbers led by 27 points at the main break and booted four second half goals. Ocean Grove have now jumped into sixth spot on the ladder with a 3-3 record after six rounds after 0-3 start to season. Grubber Sam Elford continued his bright start in 2018 and booted three goals. Elford has kicked nine goals from his last three games. Tall youngster Ned Thorley booted two majors. Anglesea’s Robert Voss finished with four goals. In Round 1 of the Under 19s Division 2 Bendigo Bank Cup Ocean Grove thrashed Anglesea by 88 points on Saturday. Final scores Ocean Grove 16.8 (104) to Anglesea 2.4 (16). Grubber pair Joseph McDonald and Sam Beasley each kicked three goals apiece. Ocean Grove quartet Lachlan Slater, Harley Pearce, Tom Ryan and Max Sutton all booted two majors. Anglesea were kept to only one goal in the first half. Leading by 50 points at the last break, the Grubbers extended their final margin with a resounding seven-goal final term blitz. Ocean Grove’s Under 19s team is the current ladder leader after round one. All four Under 19 Grading matches were completed on 28 and 29 April. In other developments, Ocean Grove faces Bellarine rivals Queenscliff this Saturday 12 April. The Round 7 BFL clash coincides with the Grubbers Ladies’ Pink Day. Saturday’s senior match starts 2:10pm at Ray Menzies Memorial Oval. Goal Kickers: P. Corredig 3, L. Cartelli 3, K. Staudt 3, J. Linton, J. Anderson, J. Carmody. Best Players: J. Carey, I. Wilkins, L. Cartelli, H. Walker, P. Hardy, J. Linton.